Travel to your favourite sailing event or regatta, taking in the conditions prior to landing. The UK is one of the premier sailing venues – we are a seafaring nation after all. Most sailing regattas and events however take place on the South Coast and Isle of Wight, thus making travelling to and from somewhat of a bind. Why endure protracted road, rail and ferry journeys when Atlas Helicopters can have you at your chosen event in comfort and on schedule in a fraction of the time taken by conventional means of transport. You will be able to travel to and from your chosen sailing event or regatta using your itinerary safe in the knowledge you will be avoiding protracted road and rail journeys thus enabling you to arrive relaxed in readiness for the day’s festivities. Prior to landing, take in the sailing course and conditions. Witness what the competitors will have to contend with. sporting event has never been higher, attracting still more people and making it harder to see the competition. Enjoy more time sailing and less time getting to the water by using a helicopter to get you to your vessel. If you want to take part in a race or simply enjoy a day’s sailing, by using a helicopter you will be free of worrying about car parking for the day or any other transport issues. Start the day refreshed and ready to head to the water as soon as possible, especially if your yacht is moored some distance from your home or office. 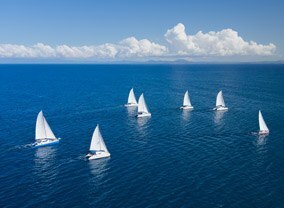 By arriving at your yacht quicker than you would if travelling by road and avoiding a long, slow, stressful journey competing with everyone else heading for the coast on a sunny day, you will feel more in the mood to enjoy your day sailing. Flexibility from using a helicopter means you will be picked up from a site close to your home or office so you will be able to take advantage of ideal sailing conditions at short notice. It also means should the weather become less favourable you are able to return home sooner rather than sitting in a car, cold and wet battling with other returning day trippers. To book one of our helicopters for a sailing event please contact our team now on 01256 635000, if one is required during the very popular Cowes Week please book as soon as possible to avoid disappointment.